Europe shares opened higher and US futures rebounded this morning, shaking off the negative sentiment permeating Asian markets as the worst month for equity investors since the 2008 financial crisis heads to a close. Yields on US Treasurys dropped, but so did the and , weighed down by a stronger , painting a mixed picture for safe-haven assets. The edged higher, within a four-day consolidation, as it tries to form a bottom above 350.00. Banks led the advance, riding the coattails of (LON:) earnings results, which handily beat expectations. 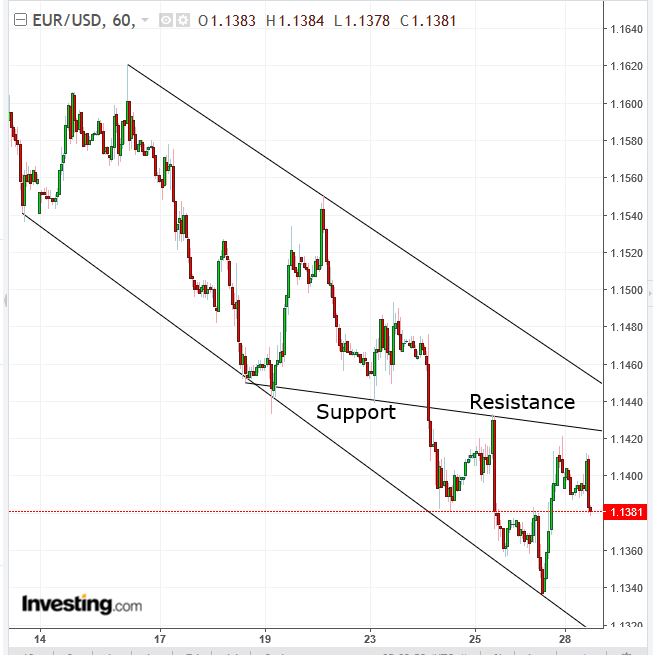 Meanwhile, the rebound seen on Friday wavered after Chancellor Angela Merkel’s coalition government took a beating in local elections on Sunday. Both leading parties, the Christian Democrats and the Social Democrats, lost around 11 percent, while the Greens and the far-right Alternative for Germany gained ground—with the latter entering the assembly of the Hesse state for the first time. Political headwinds were exacerbated when French Finance Minister Bruno Le Maire warned the eurozone would be ill-equipped to face a new economic crisis. The single currency deepened a plunge since a failed rally two-and-half weeks ago, solidifying a supply-demand reversal since Wednesday. During the Asian session, most regional stocks slipped lower on heightened volatility stemming from Friday’s tech rout, while bargain hunters provided support. China’s underperformed, falling 2.18 percent. Hong Kong’s , however, managed to avert a fifth-day decline after HSBC Holdings posted a better-than-expected 28 percent growth in third-quarter profits, helping the index close 0.38 percent higher. Australia’s outperformed (1.11 percent) gaining across the board. Financials and materials stocks helped the index seal its biggest daily advance in almost two weeks. On Friday, US stocks experienced one of the most volatile days of the year, as trade headwinds and the removal of the most accommodative monetary policy in history continued to pressure equity markets. 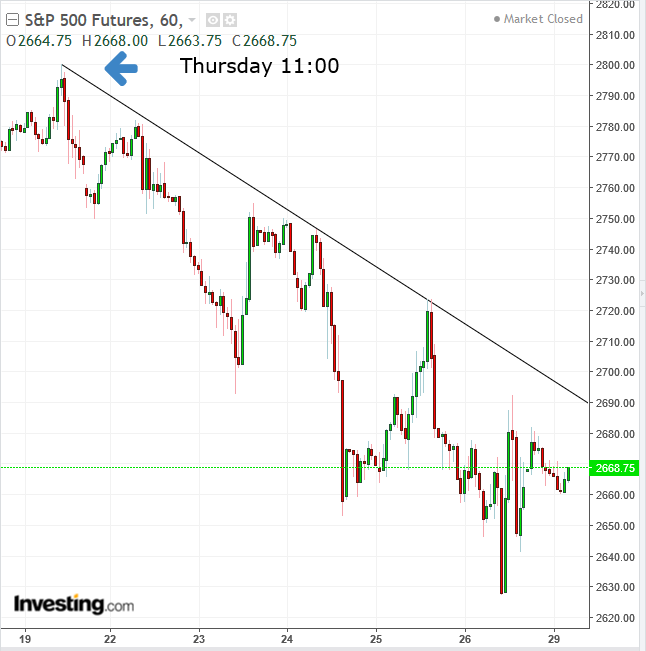 The temporarily joined the and the in corrective territory as investors rotated out of stocks and into safe-haven assets after (NASDAQ:) and (NASDAQ:) fell on softer guidance, despite having beat earnings estimates. Shares later rebounded after data confirmed an intact growth path. It is noteworthy that, despite better-than-expected economic data, investors were not willing to commit to positions over the weekend. While corporate earnings remained strong, investors—and perhaps company executives—are yielding to sentiment. Therefore, the supply-demand balance into a downtrend in the mid-term. 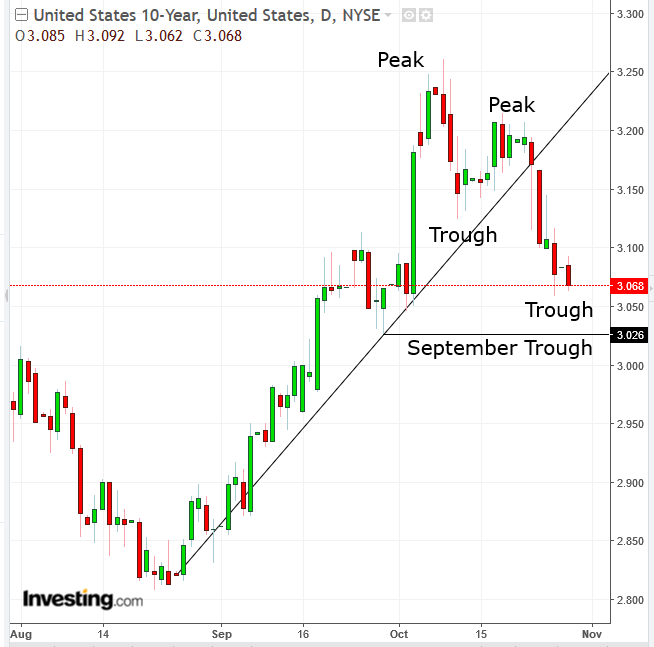 While the JPY and gold dropped against the strengthening dollar, demand for Treasuries surged, pushing yields to test the lowest level since the beginning of the month. Technically, yields entered a short-term downtrend after falling below the October 11 trough on Wednesday. The 3.026-September trough is the next test. prices ticked lower, ending a three-day advance, on both dollar strength and investors’ risk-off mood. Technically, the price is forming a rising flag, bearish with a downside breakout after a decline, such as the one from under $77. 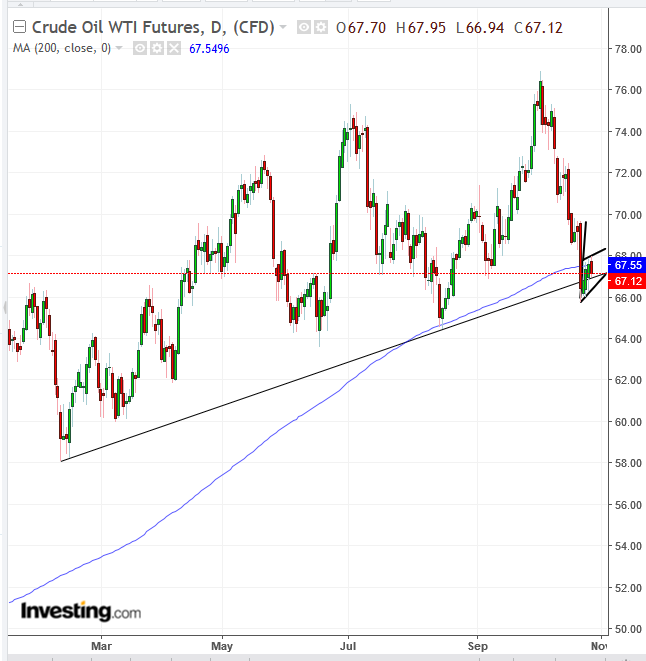 Note, the flag’s position, after the price fell below the uptrend line since November 2017 for the first time. (NASDAQ:) releases earnings tomorrow after market close, with a $1.46 EPS forecast, from $1.59 same quarter last year. (NASDAQ:) is scheduled to report Thursday after market close, with a $2.78 EPS prediction, after last year’s $2.07 for the same quarter. Exxon Mobil (NYSE:), to post corporate results Friday before market open, with an EPS forecast of $1.21, following the $0.93 in the same quarter last year. Monetary policy decisions are due in and the . On Friday, the last US before the November 6 mid-term elections is expected to show that new hirings increased by about 190,000, and the held at a 48-year low of 3.7 percent. Futures on the S&P 500 fell less than 0.05 percent. The Stoxx Europe 600 gained 0.4 percent. The UK’s climbed 0.6 percent, the most substantial climb in almost five weeks. The slid 0.1 percent, hitting the lowest level in more than 18 months with its fifth consecutive decline. The climbed 0.1 percent, the first advance in a week. The Dollar Index gained 0.2 percent. The euro climbed less than 0.05 percent to $1.1406. The advanced less than 0.05 percent to $1.2829. The Japanese yen slipped less than 0.05 percent to 111.95 per dollar. The yield on 10-year Treasuries declined one basis point to 3.06 percent, the lowest in almost four weeks. Germany’s yield increased less than one basis point to 0.36 percent, the most significant increase in more than a week. Britain’s yield dropped one basis point to 1.372 percent, hitting the lowest level in two months with its sixth straight decline. The spread of Italy’s bonds over Germany’s declined ten basis points to 2.9896 percentage points to the smallest premium in almost two weeks. West Texas Intermediate crude dropped 0.5 percent to $67.23 a barrel. Gold fell 0.2 percent to $1,230.79 an ounce, the biggest fall in a week.